(18 March 2019, Hong Kong) Real estate transaction volumes in 2018 were the strongest on record reaching US$1.75 trillion; a 4% year-on-year (y/y) growth and surpassing previous highs of US$1.68 trillion in 2017, according to new data from global real estate services firm Cushman & Wakefield. The Global Investment Atlas 2019 reviews international investment patterns from 2018 and anticipates market performance for the year ahead. The firm forecasts record levels to be maintained in 2019, in the region of US$1.75 trillion, as investors target a wider range of markets to find opportunity, and more sellers come forward as real estate strategies adjust to evolving monetary policy, geopolitical tensions and structural change. The report states that pricing is expected to edge ahead, however this will be driven by stable yields and steady rental growth for the best assets rather than yield compression which has typified recent years. Report author David Hutchings, Cushman & Wakefield’s Head of Investment Strategy EMEA Capital Markets, explains: “The economic environment is weaker than expected just a few months ago but so too is the inflation outlook on a global basis. As a result, while risk is up, the day of reckoning on interest rates for corporates and investors has again been delayed. The coming year is therefore set to see a further extension of the property cycle, offering investors another chance to get their portfolio into shape ahead of a period of slower growth. North America rebounded from 2017’s volume decline to outperform in 2018, both as a target and a source of real estate investment with late-cycle tax stimulus in the US helping to offset higher borrowing costs. Although all global regions were active buyers last year, North America was the only capital source to increase overall commercial real estate (CRE) allocations compared to 2017, with volumes increasing 17% y/y to US$546 billion. Investment volumes in North America are predicted to reach US$530.7 billion in 2019. This is a 3% decrease y/y but a reflection of the regions’ mature position in the property cycle putting upward pressure on yields and follows an exceptional 2018. CRE allocations in Europe, Middle East and Africa (EMEA) and Asia-Pacific (APAC) fell 2% and 1% respectively in 2018, the latter largely due to fewer global purchases over the year. European and Asian institutions are, however, increasing allocations to real estate, and both regions are also likely to see more inbound cross border demand, notably Europe in the short-term, and Asia in the medium-term as investors follow demographic trends. EMEA investment volumes recorded US$331 billion in 2018, a 10.8% y/y fall owing to a pull-back from both global and domestic sources and the conclusion of some large portfolio deals. European retail documented its third consecutive year of decline (US$56 billion), with lower volumes across much of the region. Industrial and office transactions also contracted by -24.7% and -9.7% y/y respectively but was likely down to a shortage of investible stock. 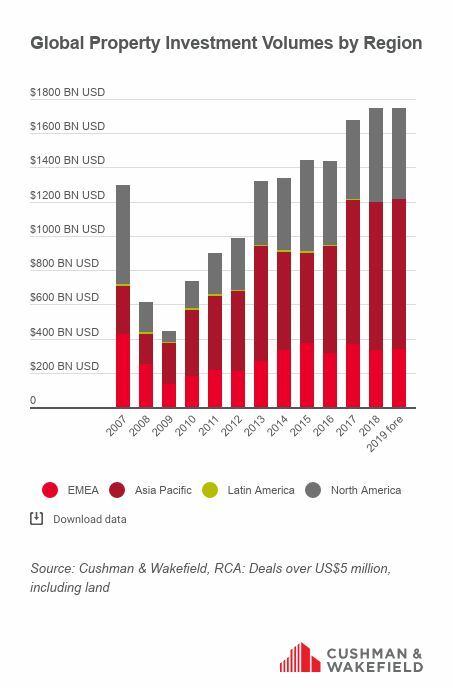 EMEA investment volumes in 2019, are predicted to reach US$339.2 billion, a 2.5% increase on 2018 levels, driven by increased demand across a growing range of tier 2 cities and new sectors. Robust levels of domestic and continental spending, led Asia-Pacific investors to maintain the highest overall share of investment volumes in 2018 at US$866 billion, a new record for the region. While domestic investors retained the majority of transaction volumes, all sources of capital targeting the area increased investment. Development sites were the most targeted sector in the region, representing 80% of the market, previous records were also surpassed in the office and industrial sectors, while the hotel market reached its strongest point post-GFC. Asia-Pacific investment volumes are forecast to reach US$875 billion in 2019, a 1% increase on 2018. Following political upheaval in Brazil, Mexico, Costa Rica and Colombia, and a pullback in investment linked to exchange rate depreciation against the dollar, Latin America recorded the lowest transaction volumes in almost ten years in 2018. Nonetheless, investment volumes are expected to leap 6% to US$2.4 billion in 2019 as opportunistic investors grow in confidence. APAC investors are increasing their exposure to the region for example, largely looking for hotels and development land. Chinese investment into logistics facilities is also expected to continue. In contrast to wider nationalist trends, cross border real estate investment has flourished, growing 10.7% to US$405 billion. This was led by stronger continental flows. Carlo Barel di Sant’Albano, Chief Executive of Cushman & Wakefield’s Global Capital Markets & Investor Services, said: “International capital flows are becoming yet more dynamic, increasingly cross border and more about balancing quality with quantity – this will be true whether you are referring to stock, yields, talent or living standards. While the USA was the top target for global CRE investment (US$45 billion), EMEA has retained its historical position as the most sought-after destination for international capital, with the most cities among the top ten cross border investment targets and attracting 53% (US$88 billion) of global investment. The USA and Canada were the top sources of cross border investment capital, together accounting for 40% of all non-domestic investment flows last year (US$125 billion). German capital rounded out the top three at US$26 billion. Interestingly, despite UK investment managers strengthening their continental portfolios, French cross-border investment outflows outpaced the UK for the first time on record. The make-up of cross border investment from Asia Pacific likewise altered, with mainland China and Hong Kong dropping back but Singapore and South Korea moving up the rankings.